Clinton, Michigan - Eden Organic Refried Beans have received the coveted Best Bite rating from Nutrition Action Healthletter in its 'Full of Beans' report September 2004 earning the highest rating for nutrition of all 38 brands with salt, and the 2nd top spot overall among 39 brands studied, one had no added salt. This is the second time Eden Beans have received the Best Bite award. In a Center for Science in the Public Interest (CSPI) study of canned beans in 1999 as reported in the May Nutrition Action Healthletter, authors awarded their Best Bite distinction to every flavor of Eden beans. Nutrition Action Healthletter is a publication of the Center for Science in the Public Interest (www.cspinet.org), a consumer advocacy organization whose missions are to conduct innovative research and advocacy programs in health and nutrition and to provide consumers with current, useful information about their health and well being. In addition to the Best Bites, Eden Refried Beans also scored as 'Best for Flavor and Nutrition' by Men's Health Magazine June 2004 in their article the '125 Best Foods for Men'. They were also rated as favorite by a panel of children and their parents in a taste test and product comparison sponsored by Child Magazine in their article '50 Healthiest Convenience Foods for Families' February 2004. "Many brands of refried beans go heavy on the fat and sodium," Child explained, "but Eden's dark red kidney beans have just 1g of fat and 180mg of sodium per half cup and plenty of fiber and potassium..." The same parent and child panel also chose Eden Organic Pasta as its favorite. It is important to choose food wisely. Commercial refried beans have calcium disodium EDTA added to preserve color and calcium chloride to keep the beans firm. They are made with inferior quality salt and the sodium levels are very high, even in most organic brands and they import their 'organic' beans from China. Refried beans are usually high in fat due to the addition of low quality, cheap vegetable oil and/or lard. Compare labels and what's inside, the choice is clear, Eden USA Family Farm Organic Refried Beans. 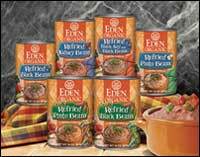 Eden Refried Beans are skillfully prepared at Eden's certified organic, AIB certified Superior, and kosher cannery. Beans are washed and soaked overnight, blanched, and milled into a puree. Whole beans are mixed into the puree for texture and appearance. This mixture is seasoned and thoroughly cooked in 16 ounce cans. There are six Eden Organic Refried Beans: • Black Beans, • Kidney Beans, • Black Soy and Black Beans, • Pinto Beans, • Spicy Pinto Beans, and • Spicy Black Beans. All Eden Beans are grown on USA family farms by those committed to building mineral rich, vital soil and producing the world's most delicious and nourishing food. The superior, decades organic soil produces superb rich flavor, high mineral and nutrient content, and strong skins with vibrant color. Eden Organic Refried Beans are lightly salted with Eden Sea Salt from the pristine waters of Algarve in southern Portugal. They contain less than half the sodium of other brands. Each is low fat, an excellent source of dietary fiber and a good source of potassium, magnesium, and high quality vegetable protein. They also provide iron, calcium, thiamin (vitamin B1), riboflavin (B2), niacin (B3), zinc, flavonoids, and antioxidants. Certified organic and kosher parve.